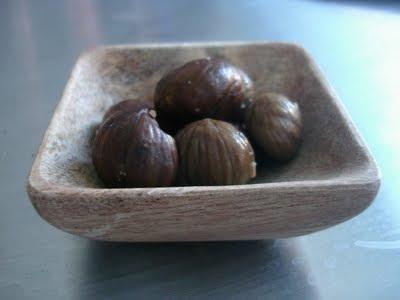 Seasonal Chestnuts: Health Nut Snack. All Year Round! If you're like most people, you probably only eat roasted European chestnuts during the fall and winter seasons. You consider them seasonal. But snackable? Year-round? Yes! The nutritional facts (and taste) say it all: Chestnuts are full of flavor, yet much lower in fat that other nuts. Chestnut Recipes. So what can you do with a roasted chestnut? A lot! Yes, chestnuts are a traditional ingredient in holiday favorites like chestnut stuffing and chestnut gravy, but the year-round recipe possibilities are endless. 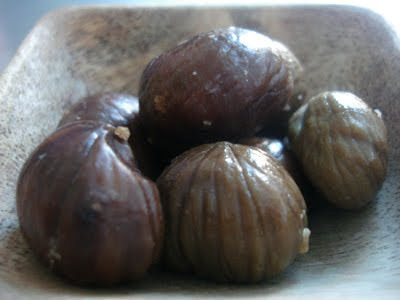 And easy-open roasted/peeled chestnut snack-pouches make adding chestnuts to your diet super easy. Straight from a pouch! You may have seen a semi-new handy-dandy snack idea: chestnuts from a to-go pouch. Yup, instead of a sack of peanuts or almonds or trail mix, you can now munch chestnuts on the go-as an everyday snack. How do they taste? I found them delicious and cravable! Are Chestnuts 'Nuts'? Does this chestnut-craze sound a bit 'nutty' to you? Well it should. Chestnuts are indeed nuts, but unlike most nuts, they are very low in fat. Chestnuts are high in complex carbs and even a good source of vitamin C. You can now find chestnuts for sale in snack sized pouches. Simply open and eat! You can also warm them in the microwave for a few seconds. I like to warm a handful in the microwave, and crumble them right over my salad or into my mashed sweet potato. Serving Size: 3 chestnuts, roasted. Shelf-Appeal: Small easy open bag. Label Check: Very low in fat, high in fiber and Vitamins C and B6. Taste Test: Nutty, creamy, crumbly texture. Sweet yet savory from the high starch content. Almost like a soft, puffy pecan. Great stand-alone snack or as a flavor enhancer to many dishes. Price: Small pouch was $3.99 at my corner health food store. About 3 snack servings in there. Last Word: Different. Very different. Certainly breaks the boredom if you are a nut-snacker. Get creative with chestnuts, your recipes will thank you.